Another day, another opportunity to despair at humanity. This time we’re heading to Bullhead City, Arizona, where a dog was found abandoned in a dumpster near the Mohave Crossroads Shopping Complex. Bullhead City Animal Care and Welfare (ACW) is calling for information trying to trace the irresponsible dog owner who apparently got tired of this poor senior dog and threw him out like trash! Animal control officers attended the site when they received a call from a trash company. 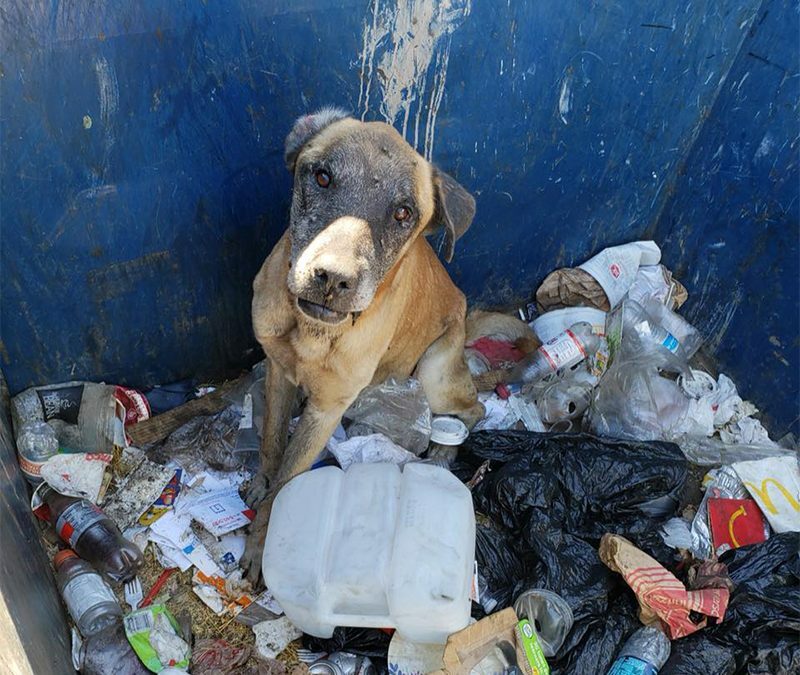 On arrival, they found this beautiful, though understandably frightened, mastiff sitting amongst the trash. If he had managed to climb out of the dumpster by himself, what would this dog have had to contend with? The Shopping Complex is off Highway 95, a busy road, which could mean this poor frightened dog might have ended up under the wheels of a car. The irresponsibility of his owners is just unbelievable. This poor boy is now receiving medical attention and some love at the Bullhead City Animal Care and Welfare shelter. Without a microchip or any other identifiers, the chance of finding this irresponsible person is slim. But that doesn’t mean we can’t look! And we shouldn’t have to say it, but if you are in a position where you find yourself no longer able to care for your pets, you don’t throw them in the trash. Would you throw out a two-legged member of your family if things got difficult? How is this any different? You bring a dog into your home, they become your family. Stories like this one are just another strong reminder of why we have to become a nation of dog adopters instead of buyers. These dogs deserve a second chance in life, and they need our love and support, not be disposed of when things get difficult. If you have any information about what led to this poor dog being abandoned or would like to know more about the work the Bullhead City Animal Care and Welfare shelter does, please visit their website. And while you’re at it, let’s sign this Care2 petition to put pressure on the Bullhead City Police Department to keep up the search for this heartless person, and get this dog the justice he deserves! I hope the abusers that did this don\’t expect to be looked after in THEIR old age!! I hope the previous horrible owners of the dog are caught and punished. A pet is like another child in the family. Would those irreponsible owners throw their child away? I hope whoever dumped this lovely dog gets caught and punished, and I mean punished. Someone must recognise this dog, a neighbour, a family member etc. I say to them do the right thing and report them. Absolute scum to treat an animal this way!